I’ve been working with a new acupuncture technique that is extremely effective at healing both acute and chronic injuries.Treating athletes and active people has always been a focus in my practice, so I am particularly excited about Muscle Channel Technique (MCT) and have been having impressive results with my clients since I began incorporating it into my healing repertoire. Because this technique uses very few needles, it’s gentle and safe—yet highly effective. In conjunction with my existing knowledge of treating injuries and pain, this is the most effective modality I have ever seen. 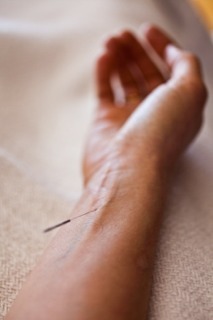 In Chinese Medicine, pain usually comes from some kind of a blockage of energy (qi) in the body. When muscles are chronically blocked, they stiffen, and so do their associated nerves. This makes it very difficult for healing nutrients in the blood to reach the affected area. MCT involves inserting needles along the channels of the body (thus, the name). We then use electro-stimulation (a very mild and safe electrical current) on two of the crucial needles to help move blood, qi and fluids. The combination of needle-work and electro-stimulation is what makes MCT so effective. Creating movement and stimulating qi and blood flow in the area dissolves the blockage and kickstarts the healing process. By relaxing the muscles, the surrounding nerves stop firing, and pain decreases immediately. For acute (meaning, recent) injuries—usually exacerbated by inflammation—MCT works in a similar way by relaxing the affected muscles. This technique is effective on injuries and pain of any kind: tendonitis, carpal tunnel, degenerative or herniated discs, knee issues, arthritis, and injuries from car accidents and other trauma. It’s also great for swelling and can be a proactive way to avoid or recover from surgery. In short, it speeds up the healing process. I’ve been trying out MCT on the dancers I work with at the San Francisco Ballet, and they’ve been very impressed with it. MCT is a relatively new approach to acupuncture that’s still rooted in classical Chinese medical theory. The points used are from the Nei Jiang Lng Shu (the 2,000+ year-old text that’s the basis for Chinese Medicine). The man who created MCT (and who I learned it from), Frank He, has simplified the traditional Eastern way of treating injury in order to apply it to modern Western bodies. I’ve experienced the healing effects of MCT firsthand. Recently, I took a run at Crissy Field. Right at the beginning of my run I started to feel a sharp pain in the front of my knee joint, but I stupidly kept running anyway. The pain got worse after the run and throughout the day, especially when I was walking down hills or stairs. Since I had the day off, I experimented with giving myself a treatment. Right away the pain started to subside. It wasn’t until later in the day that I realized I’d been walking pain-free for hours. The pain was simply gone. Of course, with chronic injuries, the healing process almost always takes longer. But MCT seems to speed up healing exponentially. I’ve had quick success diminishing pain in clients suffering from a variety of injuries, including back and neck issues. The spine is very vascular (meaning that there is a lot of blood inside our bones). When it gets blocked, it starts to degenerate. MCT opens up the vertebrae so that the flowage of qi/blood to the area improves dramatically. Stress and emotions are tied to physical healing in every modality. When I treat my clients with acupuncture I generally focus on emotional release treatments—along with massage and cupping—to diminish stress and improve healing. Adding MCT to my toolbox is exponentially enhancing my effectiveness and speed in treating pain and stress-related injury. I’ve been really amazed at how well it’s working.